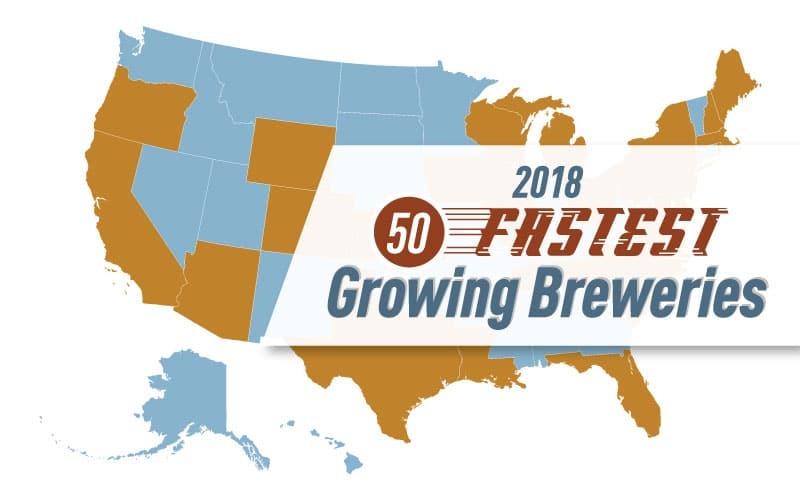 Last Wednesday the Brewers Association (BA) released its list of the 50 Fastest Growing U.S. Craft Breweries for 2018, an annual compilation of small and independent breweries that increased their year over year production by the highest percentage. Among them were three Massachusetts breweries: Brewpub and DIY on-premises brewing operation Hopsters Brewing was listed as the 15th fastest growing brewery in the nation, Newburyport’s RiverWalk Brewing was 27th, and Charlton based Tree House Brewing came it at 45th. All three breweries more than doubled their production from the previous year. Hopsters, which opened a second location in Boston’s For Point neighborhood, grew its production from just 266 barrels in 2017 to over 800 this past year. They also made the list of fastest growing breweries in 2017. “To be ranked again in 2018 validates our decision to open in Boston’s Seaport neighborhood and it’s a testament to our amazingly dedicated staff and leadership,” said Founder and CEO Lee Cooper. Newburyport’s RiverWalk Brewing was pleasantly surprised to be on the list said founder and brewer Steve Sanderson. “We honestly don’t focus too much on the barrel production here,” he explained. “It’s a metric that’s easy to quantify, but the important growth comes from building our community, creating jobs, and fulfilling our mission.” In 2017, during an expansion and move across town, his brewery packaged 880 barrels of its own beer (they also had some contract brewed at Mercury Brewing). Last year their in-house production number jumped to 2,400 barrels. Also in the top 50 was Tree House Brewing, already considered a regional brewery (15,000-plus in annual production), whose move to a state-of-the-art facility in Charlton during 2017 allowed them to more than double their previous production and open a taproom. They report their annual numbers to the BA but without granting permission for publication, but a look at state tax records reveals that they cranked out more than 40,000 barrels during 2018, an astonishing number when you consider that practically all of it was sold straight to the consumer. Outside of a few brewpub chains, Tree House is the largest producing brewery in the U.S. without any distribution. How about Berkley Beer Company. Made in Berkley Mass. Superb.